The Oseco capital projects team was approached by a major polyethylene producer in North America in the Spring of 2016. The company had recently built a new polyethylene unit, and was experiencing premature failures of a competitor's rupture discs in a very critical application. Due to these failures, the unit was unable to be officially commissioned until the problem was resolved, causing a negative impact on revenue. After multiple attempts by their supplier to resolve the issue and re-design the rupture disc, the problem persisted. In addition, all other possible technologies to resolve the issue were investigated and did not present any options. 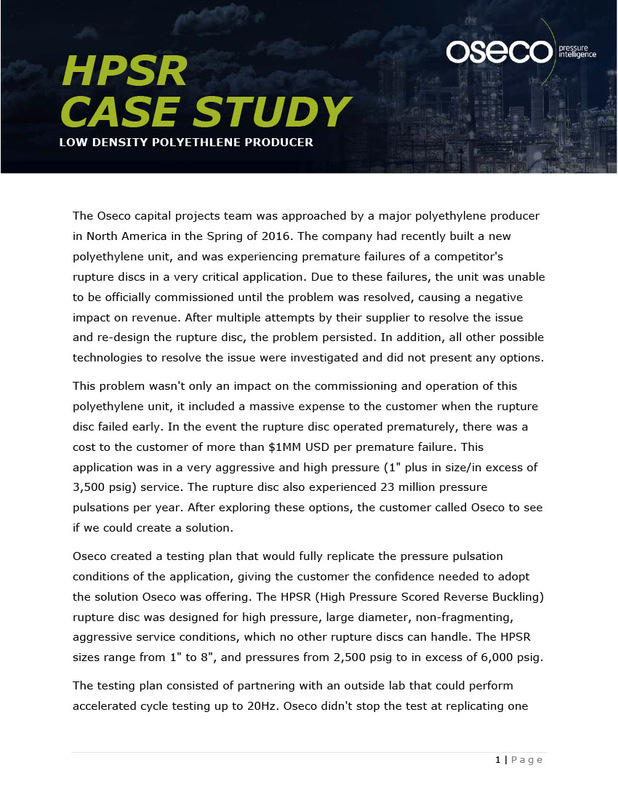 This problem wasn't only an impact on the commissioning and operation of this polyethylene unit, it included a massive expense to the customer when the rupture disc failed early. In the event the rupture disc operated prematurely, there was a cost to the customer of more than $1MM USD per premature failure. This application was in a very aggressive and high pressure (1" plus in size/in excess of 3,500 psig) service. The rupture disc also experienced 23 million pressure pulsations per year. After exploring these options, the customer called Oseco to see if we could create a solution. Oseco created a testing plan that would fully replicate the pressure pulsation conditions of the application, giving the customer the confidence needed to adopt the solution Oseco was offering. The HPSR (High Pressure Scored Reverse Buckling) rupture disc was designed for high pressure, large diameter, non-fragmenting, aggressive service conditions, which no other rupture discs can handle. The HPSR sizes range from 1" to 8", and pressures from 2,500 psig to in excess of 6,000 psig. The testing plan consisted of partnering with an outside lab that could perform accelerated cycle testing up to 20Hz. Oseco didn't stop the test at replicating one year of rupture disc service, as the test was performed to replicate a full two years of service equaling 48 million cycles. Once the cycle testing was concluded, the test samples were burst tested and performed well within the ASME VIII tolerance required. The customer was thrilled with these results and specified the Oseco HPSR on this application along with other aggressive services within their facility.The work that Oseco did on this project has carried over to other units within the customer's additional production sites. The Oseco HPSR is now being specified in throughout the customer's organization. The HPSR’s value not only resolves our customer’s issue, but it is also preventing future issues and loss of revenue through exceptional reliability and consistency of activation.